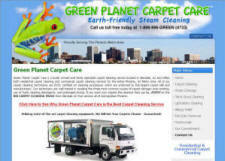 We took over Green Planet Carpet Care because of poor search engine rankings. The original website was designed by Allan Sturm. Allan did a great job of the making the site look good but developed the site using Joomla and left quite a few code errors on the pages. The code errors caused cross browser compatibility issues and worse, the site was not being ranked by the major search engines after one year of being online. One issue was the "meta tag" for the "Content-Language" was showing the site to be located in Great Brittan. This caused the search engines to ignore the site web someone searched for carpet cleaning in Glendale, AZ. We moved this site to a server that supports ASP.NET, fixed the code, and submitted the site to the major search engines. Bryan also had the opportunity to pickup several other domain names so we created a similar websites to help improve his search engine rankings. We host some of these websites and on our servers and also provide DNS hosting. Our on going SEO services include monitoring their traffic with Google Analytics and making whatever changes are necessary to the page content to keep their site ranked well. We also post ads daily on Craig's List. 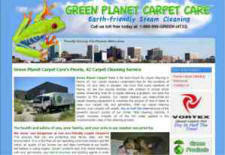 We also manage Green Planet Carpet Care's back links. They are currently seeking back links from other restoration companies and contractors from around the U.S. If you are interested in exchanging links with any of their websites, please visit our Link Exchange page. As you know, exchanging links benefits both of us by raising our search engine rankings and generating more traffic to both of our sites. Best of all it is FREE; there is no cost or hidden fee. We simply ask for a link back from a page of your site. 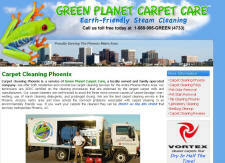 Green Planet Carpet Care is a family operated Glendale AZ carpet cleaning company that services the entire Phoenix, AZ metro area. We Get Your Carpets Cleaner - Guaranteed! 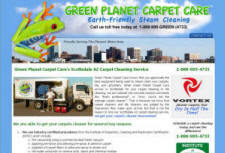 Green Planet Carpet Careâ€™s Eco-Friendly Anthem, AZ carpet cleaning service is a family operated carpet cleaning service. Located in North Phoenix Arizona that also services Anthem Arizona. With Green Planet Carpet Careâ€™s eco-friendly Scottsdale AZ carpet cleaning service, you can trust our employees, equipment, and reputation to get your floors cleaner. We will not disappoint you! Eco-Friendly Carpet Cleaning Phoenix AZ. Our environmentally friendly carpet cleaning service will dry your carpets in half the time with NO residue. Carpet Cleaning Mesa, AZ is an environmentally friendly carpet care service. We are kid and pet safe, your carpets dry in half the time and we guarantee to get your carpets cleaner! An environmentally friendly Peoria, AZ carpet cleaning service. We are kid and pet safe and your carpets dry in half the time. We Get Your Carpets Cleaner - Guaranteed! "After being scammed by three SEO companies that did not deliver or meet my expectations, I contacted Terry with McGrath Electronics. He explained everything in detail very well, and my instinct trusted his experience. I hired him to fix code, optimize and submit my website. This was not an easy task being another company screwed things up. Within 4-5 weeks my phone started ringing from his work. 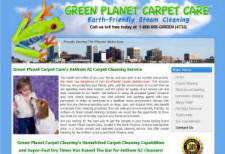 Now I have 5 separate websites reeling in clients for my high-end carpet cleaning co."